Tommy Fuller accidentally discovers that his family's house is a stop on the Underground Railroad when he finds a family of runaway slaves hiding in the barn. 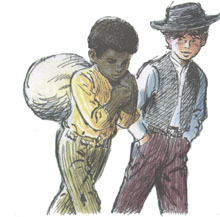 Now that he knows, can Tommy be trusted to help his father transport the slaves in the hay wagon to the next safe haven? "Young Tommy Fuller discovers his house is a stop on the Underground Railroad, and he joins his father to accompany a group of slaves to the next safe haven. U.S. Marshals threaten to end the journey when they demand to search the hay wagon for runaways. Can Tommy and his father keep the slaves safe and hidden? “Follow the Drinking Gourd,” a meaningful song to the slaves, is played at the beginning and during intervals throughout the story, underscoring the significance of the lyrics and music. Sound effects, including hoofbeats and a whippoorwill’s nighttime call, add dimension to this I Can Read story. Collins only slightly alters his tones to voice characters, but textual clues and book illustrations help youngsters easily identify the speakers. Collins also reads the author’s note detailing the history of slavery and role of the Underground Railroad."